Barcode Reader Toolkit for Windows - Download Now! 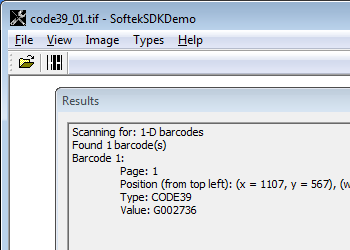 The Softek Barcode Reader is a toolkit that allows developers to add barcode detection to their applications. The toolkit takes image files or memory bitmaps as input and returns information about each barcode, including value, type and position. 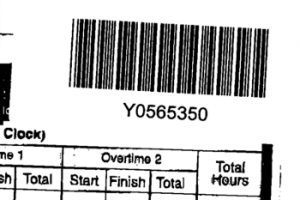 All major linear (1-D) barcodes (such as code 39) and 2-D barcodes (such as DataMatrix, PDF-417 and QR-Code) are supported in the toolkit as standard. Download and try for free with a 30-day evaluation license, which can be requested from sales@bardecode.com. The download is a fully functional version of the toolkit and you can access free support during the evaluation period. With over ten years of development and refinement the SDK is both fast and efficient. Licenses are available to suit all requirements, either per installation or as a distribution license. Improved PDF support through the Debenu library. Control over large scans via background reading. 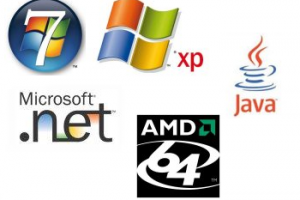 Automatic support for multi-core processors. Improved Code 39, Code 128, Datamatrix and QrCode recognition. 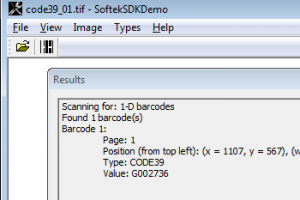 If you are evaluating the SDK then the first thing you might wish to do is test out your images with the SoftekSDKDemo application. This is quick and easy with our demo application which displays image files, allows you to alter the settings in the toolkit and displays details of any barcodes found in an image. Since the SDK has image clean up capabilities there are many setting which can be used to improve read rates on otherwise unreliable barcodes.